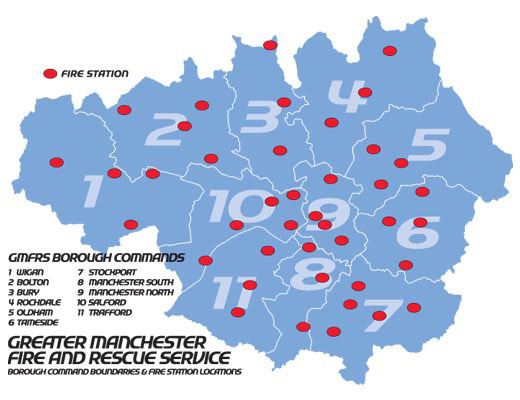 Greater Manchester Fire and Rescue Service is structured into 11 Borough Commands, aligned to the 10 local authorities in the county - Bolton, Bury, Manchester, Oldham, Rochdale, Salford, Stockport, Tameside, Trafford and Wigan. What are the aims for the Borough Commands? Improving the social, economic and environmental wellbeing of the boroughs and its inhabitants. Engaging, improving and strengthening our links with all our partners. Partnerships will be set up to target the needs of individual communities within the boroughs. Improving the quality and professionalism of the service we provide and we will strive to achieve our service ambitions inline with our published Integrated Risk Management Plan.